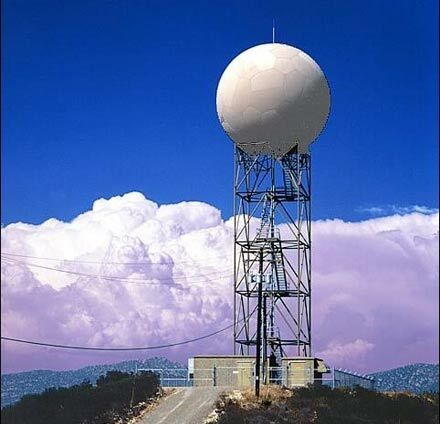 Radar is an acronym meaning Radio Detection and Ranging (RADAR). During its initial development in World War II, weather was treated as "clutter", a problem that kept radar operators from seeing enemy targets. Shortly after the end of the war, scientists realized the great benefit of using radar to study storms. The radar displayed previously unseen patterns of storm growth and structure. Doppler capabilities added much later allowed for the detection of tornadoes and downbursts, as scientists could now "see" the wind via the movement of energy returns back to the radar and infer motion from these returns. If you have ever stood near a railroad track as a train was approaching then passing by, or listened as an emergency vehicle with siren blaring passed by, you have heard the change in pitch as the sound comes towards you then departs away from you. This is the Doppler effect. In it's most basic form, the radar sends out a pulse of energy which strikes an object and returns back to the radar dish. The time it takes to leave and return is used to compute the distance of the object (like a raindrop) from the radar. The change in the frequency of that emitted pulse tells whether the object it struck is moving towards or away from the radar, thus the computer in the radar infers motion. Radar also showed its utility in estimating precipitation. The traditional way of turning radar measurements into rainfall data is to relate the power returned from the cloud to the radar (meteorologists refer to this as the "radar reflectivity") to some estimate of rain intensity measured on the ground. Once this so called Z-R relationship is determined, the radar data can be converted directly to rainfall over the entire coverage region of the radar. Usually, the rainfall estimates in the Z-R relationship come from rain gauge networks. 4. The radar volume at all ranges is very much larger than the sample volume of a rain gauge on the ground. This large volume may have a variety of reflectors - i.e. snow, hail, raindrops and cloud drops, all of which contribute to the reflectivity but which have very different water contents. Content for this post was adapted from a similar post on the CoCoRaHS blog. 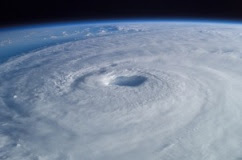 The start of Atlantic Hurricane season is tomorrow, June 1, and there seems to be much fear and trepidation as this season begins. There are a few reasons for general increase in trepidation, but most of it is simply grounded in the unknown - from dire forecasts of doom and gloom, to a lingering environmental disaster in the Gulf of Mexico known as "Deepwater Horizon", to a ravished Haiti following the recent earthquakes. Hopefully, some of this nervous energy will be translated to adequate preparation, especially for those along the coastal regions of our country and in the Caribbean. 1. Forecasts from many trusted sources, including NOAA, Colorado State University's Drs. Gray and Klotzbach, and AccuWeather's Dr. Joe Bastardi, all point to an active (some like NOAA label it "hyperactive") 2010 season, based on many variables that are either known or at least well-education guesses. These include the cessation of El Nino conditions that affected our recent winter season, and a possible swing back towards La Nina conditions; above average sea surface temperatures (in some locations, record warmth) in the main development regions for hurricanes from the Caribbean to eastern Atlantic off the coast of Africa; and the fact that we continue to be in the midst of a decades-long cycle of general increased activity called the Atlantic Multidecadal Oscillation (AMO). All of these factors lead to forecasts of increased activity. I'll refer you back to my previous post from early April, "Looking Ahead: Hurricane Season 2010" for more information. 2. The devastation caused by earthquakes in Haiti has left that country highly vulnerable to major storms. A direct strike (or worse, perhaps multiple impacts) would create chaotic and desperate conditions for this island nation that has seen it's share of suffering. Many Caribbean nations are third world countries and are not prepared to deal with serious blows from Mother Nature. 3. The Deepwater Horizon oil spill is perhaps the biggest unknown as far as its effects on an approaching tropical system, or even the effects of a storm on the oil slick. Never before has a hurricane churned through an oil spill anywhere close to this magnitude, so the impacts are not well known. However, I will refer you to a well-written article by oft-cited Dr. Jeff Masters of Weather Underground for potential impacts. The most problematic issue appears to be the transport of oil to the coastline, and inland, on storm surge (which could potentially be devastating) and, to a lesser extent, transport of oil and other toxic substances miles inland due to the sheer force of the wind. Less probable are oil falling with the rain from the storm (oil and water don't mix) and lightning strikes on an oil slick causing a massive fire. 4. Just last week, the Loop Current, a warm ocean current that loops through the Gulf of Mexico and then leads into the Florida straits and eventually into the Gulf Stream, cut itself off and became an eddy over the Gulf (which is a common occurrence happening no less than once a year). This has created a 250-mile diameter circle of warm waters over the northeastern Gulf of Mexico that could easily serve to intensify storms traversing the region due to increased warmth of the life-giving ocean waters beneath the storm. A similar eddy fueled Hurricanes Katrina and Rita in 2005. For more on this development, I'll again point you to a Dr. Masters article. 14-23 named storms, 8-14 hurricanes, 3-7 major hurricanes, 85% chance of an above normal season and an "increased threat of landfall"
So, as hurricane season begins, it is wise for those that could potentially be in the path of one of these storms to make all necessary preparations and pay close attention to forecasts and watches/warnings as they are issued by the National Hurricane Center. For those living in the Mid-South, MemphisWeather.net's tropical page will have the latest storm tracks and bulletins. Be mindful that, while the threat is not nearly as great here, remnants of tropical systems can bring widespread flooding rains, tropical storm force wind, and/or severe weather to this region of the country. A summertime pattern has developed over the Mid-South this week as high pressure is overridding unseasonably warm and moist air near the surface. Upper-level disturbances rotating through the region are helping to set off scattered thunderstorms during the peak heating hours of the day. 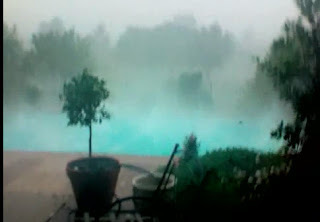 On Monday, these storms fired over the greater Memphis area and brought reports of hail, some high wind gusts, and torrential rain that led to flash flooding in many locations. A repeat is possible this afternoon. These storms are sometimes referred to as "pulse" storms and often times have very little motion, which is the reason for the locally high rainfall amounts and flooding potential. Pulse storms, or airmass storms, are frequently associated with hot, humid airmasses (most often in the southeastern and south-central U.S.) that move very little due to weak winds at upper levels. Typically, wind at about 15,000-25,000 feet drives the direction of motion of a thunderstorm. When the wind at those levels is weak or non-existent (as when high pressure exists over the region), the storms move very little. Instead, the entire life-cycle of the storm plays out over a small land area below - from cumulus cloud development through the growth phase, into maturity, and finally the decay phase. Pulse storms can go through this development cycle multiple times, or more likely produce "child" cells nearby that grow and decay and then produce additional storms. The child cells are typically initiated by outflows from their parent cells which occur as the parent cell begins to collapse, producing a downdraft that hits the ground and spreads out as a gust front or outflow. The downdraft phase is typically when straight-line wind damage is most likely at the surface as wind speeds in these downdrafts can exceed severe wind criteria (58 mph). Flash flooding becomes likely when the movement of these storms, and their child cells, are nearly stationary and the life cycle plays out over a small area, potentially bringing a couple of inches of rain in an hour or two. For more information, check out NWS Jetstream's pages on the life cycle of a thunderstorm and downbursts and damaging wind. I thought I'd share a couple of videos of extreme weather with you today. Also of note, the Atlantic Hurricane Season gets underway on June 1. Already, computer models are hinting at development offshore the Mid-Atlantic coastline by the middle of next week. With the end of El Nino conditions and record warm waters being found in the favored tropical development regions, all signs point to what could be a very busy 2010 season - much moreso than 2009. Stay tuned! Where's all the rain that was promised? I know there are very few complaints that the forecasted rain and thunderstorms (Flash Flood Watches/Severe Thunderstorm Watches) didn't materialize yesterday and overnight after record flooding earlier in the month that many are still recovering from. However, you still may be curious about how all the forecasters seemingly missed the boat on this one (pardon the pun). Below are the 24-hour forecast rainfall totals from several computer models, all valid from 7am Thursday to 7am Friday (this morning). You'll recall this was roughly the period of the Flash Flood Watch that was issued on Wednesday. 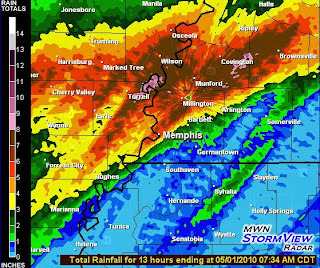 Generally, Memphis-area forecasters were expecting anywhere from 1-3" of widespread rain. The primary computer models used for this area - the GFS and NAM (the first two images below, respectively) - differed widely in their handling of the approaching system up until the night before, lowering the forecast confidence a great deal. Thumbnails of the model forecasts are below and can be clicked for larger views. The high-res WRF model (last two images) actually did a pretty good job showing the heavier precip east of the Memphis area. As this system departs the region today, we are in for another pattern shift, this one fairly significant, as high pressure typical of summertime in the Mid-South builds in overhead. Dewpoints are not dropping a lot behind the departing front, so there will be some humidity in the air, but the big story will be widespread 90+ degree temperatures as we head into the weekend and next week. By early next week, some additional Gulf moisture will work its way in and we will likely see some scattered afternoon and evening showers and thunderstorms for the mid-week time frame, though temperatures will continue to run near 90 in the afternoons through the week. Details can always be found in the MWN Forecast. Finally, a word on MemphisWeather.net (the site). A new layout is coming very soon! Content will change very little, however the menus will move to the left side of the screen, the format will be wider, and you'll be able to get to the most frequently-used site content more quickly from the front page. I think you'll like it! For more information on this, and other items related to MWN, including sneak peeks at new features before they are released to the general public, sign up for the MWN Newsletter! WARM AND MOIST AIR WILL BUILD INTO THE MID-SOUTH WEDNESDAY NIGHT BEHIND A NORTHWARD MOVING WARM FRONT. STRONG TO SEVERE THUNDERSTORMS AND FLASH FLOODING WILL BE POSSIBLE NEAR THIS FRONT WEDNESDAY NIGHT... ESPECIALLY OVER EASTERN ARKANSAS... WEST TENNESSEE AND THE MISSOURI BOOTHEEL. THE ATMOSPHERE WILL BECOME VERY UNSTABLE BY THURSDAY AFTERNOON... IN ADVANCE OF DEEPENING SURFACE LOW LIFTING NORTH THROUGH ARKANSAS. THIS INSTABILITY... COMBINED WITH STRONG WIND SHEAR... WILL PROVIDE FAVORABLE CONDITIONS FOR RAPID DEVELOPMENT OF SUPERCELL THUNDERSTORMS OVER THE MID-SOUTH ON THURSDAY. TORNADOES WILL BE POSSIBLE... A FEW OF WHICH COULD BE PARTICULARLY STRONG AND LONG LIVED. IN ADDITION TO THE TORNADO THREAT... VERY LARGE HAIL AND STRAIGHT-LINE WIND GUSTS WELL IN EXCESS OF 60 MPH WILL BE POSSIBLE THROUGH THE EARLY MORNING HOURS ON FRIDAY. THE FLASH FLOOD THREAT WILL CONTINUE THROUGH THE DAY THURSDAY... EXPANDING TO INCLUDE ALL OF THE MID-SOUTH THURSDAY AFTERNOON THROUGH THE EARLY PART OF FRIDAY. THIS IS A POTENTIALLY DANGEROUS WEATHER SITUATION. IF YOU DO NOT HAVE A WEATHER RADIO... THIS IS A GOOD TIME TO PURCHASE ONE. IN ADDITION... YOU SHOULD REVIEW SEVERE WEATHER SAFETY RULES. KNOW THE DIFFERENCE BETWEEN A WATCH AND A WARNING AND BE READY TO PUT YOUR SAFETY PLANS INTO ACTION WHEN SEVERE WEATHER THREATENS. THIS HAZARDOUS WEATHER OUTLOOK IS FOR PORTIONS OF EAST ARKANSAS... THE MISSOURI BOOTHEEL... NORTH MISSISSIPPI... AND WEST TENNESSEE. HEAVY RAINFALL... FLASH FLOODING... AND STRONG THUNDERSTORMS ARE POSSIBLE WEDNESDAY NIGHT INTO THURSDAY MORNING NORTH OF A FORREST CITY ARKANSAS TO MEMPHIS TO SAVANNAH TENNESSEE LINE... INCLUDING MUCH OF THE MEMPHIS METROPOLITAN AREA. A FLASH FLOOD WATCH IS IN EFFECT FOR THESE AREAS. THERE IS A SLIGHT RISK OF SEVERE THUNDERSTORMS THURSDAY AND THURSDAY NIGHT ACROSS THE WESTERN PORTIONS OF THE MID-SOUTH... INCLUDING THE MEMPHIS METRO AREA. TORNADOES... LARGE HAIL... AND DAMAGING WINDS WILL BE POSSIBLE FROM THESE STORMS. LOCALLY HEAVY RAINFALL AND FLASH FLOODING MAY ALSO BE POSSIBLE. STRONG TO SEVERE THUNDERSTORMS MAY ALSO CONTINUE ACROSS THE MID-SOUTH INTO FRIDAY. Did you see it? If you're not an avid weather watcher, or even if you are, you may have missed it. 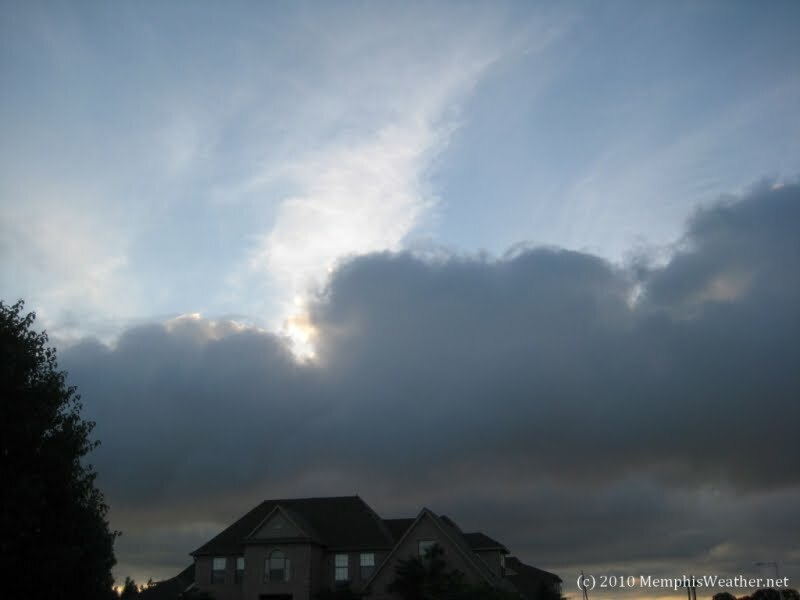 Just after sunrise this morning (Tuesday, May 18), a narrow band of stratus clouds set up over eastern Shelby County extending from north to south. From the pictures taken below (minus the surrounding landscape), you might first guess that these were taken along the California coastline, or in San Francisco Bay. Au contraire! This narrow band of low stratus clouds, with bases at about 1,500 feet, set up over Lakeland south across Cordova and on to Germantown. 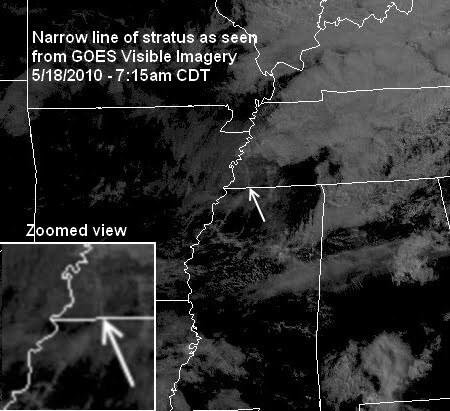 The line even showed up on early morning visible satellite imagery (see the last image below, showing a narrow north-south line of slightly brighter white over eastern Shelby County). The satellite even indicates that the cloud line may have extended south into eastern DeSoto County, then tailed back southwest towards eastern Tunica County. What caused it is anyones guess. One possibility is that the clouds could have formed along a boundary between two slightly different airmasses with slightly different temperature or moisture characteristics, perhaps leftover from yesterday afternoon's thunderstorms that were scattered about the region. In any case, it was an interesting phenomena to note, take a couple of pictures of, and observe from a satellite 22,500 miles up! 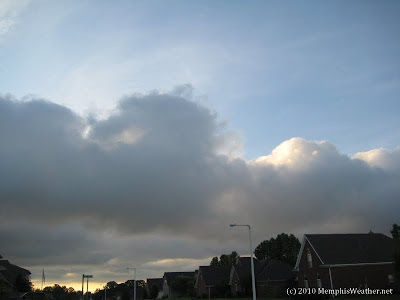 What caused rapid storm intensification over Memphis on the evening of May 16, 2010? On the evening of May 16, 2010, a mesoscale convective system (MCS) moved into the Mid-South from the west. The quasi-linear complex of thunderstorms, followed by an area of rain, reached the metro area around 7pm. As it approached, the strongest storms were a bowing segment of thunderstorms south of the city over northwest Mississippi and strong/severe storms well north, with a relative dearth of strong storms directly west of the bridge. It appeared the city would miss the strongest activity. As evidenced by the StormView Radar loop shown below, while no severe storms struck the city, there was a definite "explosion" of heavier precipitation along a north-south line (basically right along the Midtown stretch of I-240 north into Shelby Forest) just after the outflow boundary ahead of the area of precipitation reached the city. The very heavy precipitation didn't continue across Shelby County, but preceded several miles before weakening again (after the time of this loop). So what caused the sudden explosion of precipitation intensities? Could it have been an urban heat island effect, which could have easily provided extra convective potential? Perhaps another atmospheric boundary of some sort existed across that region? These types of systems are certainly not steady-state either, so it could have been a natural progression of the convective system. I didn't get a good chance to examine the data in real-time; I'll take a closer look and let you know if I find anything. In any case, it made for an interesting radar loop worth sharing. Scattered thunderstorms broke out by late afternoon as a cold front moved across the metropolitan region. Many of these storms became severe with multiple reports of large hail to the size of golf balls, along with very heavy rain from the slow-moving storms. Storms affected the World Championship Barbecue Cooking Contest for a couple of hours between about 5:30-7:30pm. Fortunately the strongest storms missed Tom Lee Park. 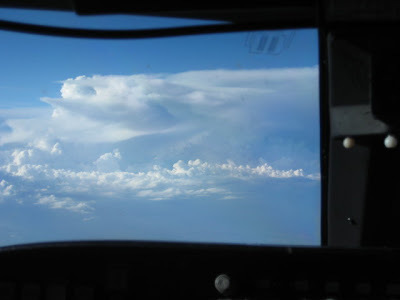 The first picture below was taken by an airline employee jumpseating in the cockpit of a regional jet as it made it's approach into Memphis from the south during the storms. By 8pm, most of the storms had dissipated as the sun set. 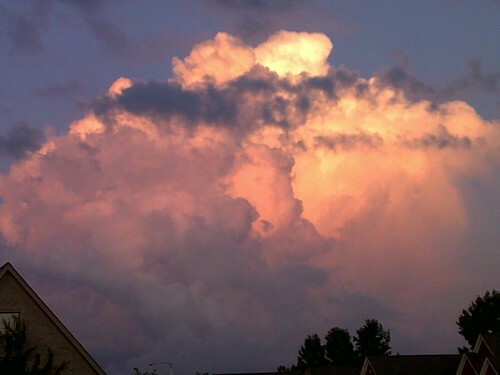 The second picture was taken looking southeast from northern Bartlett as clouds began to break apart. Today looks like it could be a repeat event. The front has stalled out over the region and another atmospheric disturbance will be moving through this afternoon. With temperatures recovering into the 80s, the presence of the front and disturbance will set off another round of storms. Today's storms could fire off a little earlier in the afternoon than yesterday's and once again the Mid-South is in a slight risk of severe weather (see graphic below). The main threats are similar to yesterday: large hail, isolated damaging wind gusts, dangerous lightning, and heavy rain. If you're headed out this afternoon or evening, take your umbrella and be alert to quickly changing weather conditions. MWN resources you should monitor include our Facebook and Twitter pages (@memphisweather1, or @shelbyalerts for Shelby County watches and warnings), MWN Mobile weather (with radar), and the new MWN Storm Center webpage. Very little has changed with regards to the expected weather pattern for the Memphis in May World Championship Barbecue Cooking Contest which kicks off today and continues through Saturday. You can view my previous forecast post here. A cold front will move into the region tonight, pushing slowly through metro area during the day Friday and stalling out over north MS on Friday night and Saturday. The presence of the front, along with abundant moisture and instability, will cause scattered showers and thunderstorms to develop beginning late tonight and lasting through Friday. Most activity is expected to die off Friday evening, though more scattered precipitation will be around on Saturday. The severe weather threat is marginal as most of the necessary dynamics will be east of the region, from middle TN into the mid-Atlantic. However, an isolated strong storm could produce a brief high wind gust or small hail, especially during peak heating hours on Friday and Saturday afternoons. For a complete look at the forecast, please visit the MWN Forecast at MemphisWeather.net. 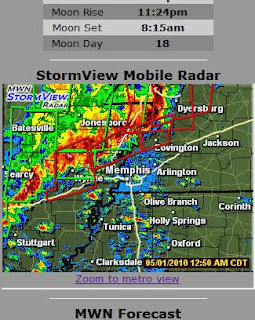 In addition, if you are hanging out downtown this weekend and need a quick check of radar or the forecast, check out MWN Mobile on your web-enabled handheld device (http://pda.memphisweather.net) for the latest conditions, forecast information, and the best web-based radar in Memphis - StormView Mobile Radar. You can also follow @memphisweather1 on Twitter or MWN on Facebook (http://www.facebook.com/memphisweather1) for more frequent updates. THURSDAY - Partly sunny and hot with noticeable, but not suffocating, humidity. Breezy with a slight chance of afternoon t'storms. High of 88. Rain chance 20%. FRIDAY - Partly sunny with a chance of thunderstorms anytime. Morning low near 70. Afternoon high around 85. Rain chance 40%. SATURDAY - Partly sunny with a chance of mainly afternoon thunderstorms. Slightly less humidity. Morning low near 65. Afternoon high near 84. Rain chance 30%. SUNDAY - Mostly cloudy with scattered thunderstorms. Morning low near 65. Afternoon high near 83. Rain chance 40%. Regular forecast updates throughout the upcoming week can be found on MemphisWeather.net. We welcome all out-of-towners and visitors to Memphis and hope you find your stay here comfortable! One thing that can be said about the weather the past couple of weeks - persistence forecasting doesn't work! It seems like every few days another shift is taking place in the atmosphere, taking us from one extreme to the other - from severe weather, to flooding, to 90 degrees and humid, to cloudy, cool, and breezy, and now right back to near 90, followed by scattered afternoon thunderstorms! Just so that you don't start putting the blame on your favorite flavor of climate change, understand that rapid changes in the weather this time of year are perfectly normal. In fact, spring may be the time of year that the phrase was coined, "if you don't like the weather, stick around; it'll change!" This week, we're coming out of a cooler pattern that brought us nice conditions over the weekend into one more typical of early summer. A warm front is moving through the region today, bringing an end to the cool weather and placing us back in a "warm sector" that will mean increased humidity, southerly breezes, and temperatures well into the 80s. As high pressure builds over the southeast U.S. (see upper-level forecast map below), upper 80s to near 90 temps and dewpoints in the mid 60s will be common. The high dewpoints, mix of clouds, and steady southerly wind will also mean warm overnight lows near 70 in the metropolitan area. These conditions will last for a few days before another cold front approaches the area on Friday. Unfortunately, but not atypically, the strength of the high pressure over the southeast will keep that front from moving through quickly, which will result in daily chances of thunderstorms, primarily of the afternoon and early evening variety, Friday through the weekend. Early signs point to a upper-level trough that will move into the Mississippi Valley early next week which would finally push the front away from the region (see upper-level map below and note the differences from the map above). Depending on cloud cover and precipitation, high temps this weekend should be in the mid 80s with overnight lows remaining in the 60s. The average high temperature for this time of year is near 80 with lows typically dropping to near 60. For the latest forecast conditions on a daily basis visit MemphisWeather.net and the MWN Forecast - the most accurate for the Memphis area. The second weekend in a row of significant weather had the southeast U.S., including the Mid-South, in it's crosshairs for the first weekend in May. Here, we focus on effects of the storms in the immediate Memphis metro area, with some additional overview information regarding west Tennessee, eastern Arkansas, and north Mississippi. Many other readily available sources, including mass media, have excellent coverage of middle Tennessee. There are several links to other pages contained herein. You may wish to right-click on these links and open them in new windows/tabs in order to keep this post open. As early as last Tuesday, MWN was raising the red flag about the possibility of severe storms and very wet conditions for Memphis in May's Beale Street Music Festival weekend. Updates were provided on Wednesday by the NWS and MWN on this blog warning of severe weather, including the possibility of tornadoes and flooding. By the end of the week, the Storm Prediction Center had placed the Mid-South in a rare (but for the second weekend in a row) "High Risk" of severe weather for Friday night through Saturday night. The stage was set (not the ones in Tom Lee Park for MusicFest) for a potential outbreak of violent storms and a significant risk for flooding due to the expected slow motion of the approaching storm system. As meteorologists, we never know just how these events will play out, but we typically know the potential given the atmospheric conditions. In this case, the tornado potential was high and those conditions were born out (though not as severely as the previous weekend) and the flooding potential was life-threatening, which was stressed in Flash Flood Watches prior to the event and warned of the possibility of 10-12" in localized areas. Little did we know that the 10-12" would be widespread across a large region (along and north of I-40 from Memphis to east of Nashville as seen in the graphic below), with isolated amounts near 16-18" in eastern Tipton County and middle Tennessee! The severe weather began in east Arkansas late Friday evening, triggered by an upper-level disturbance and approaching frontal system, as mainly hail and high winds and continued throughout most of the night as a line of storms moved across west Tennessee just north of the Memphis area. 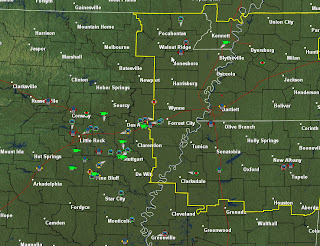 Meanwhile, storms remained just west of Memphis into the wee hours Saturday morning as well. A screenshot taken from StormView Mobile Radar just before 1am shows the line going by to the north of the city (below). Along the southern end of the line, little southward progress was made and storms with torrential rain trained one after another over the same areas as the severe weather threat shifted to flash flooding. The high rainfall rates (2-3"+ per hour for multiple hours in some cases) and continuous storms brought flooding conditions to areas along and north of I-40, including Millington, Arlington, Covington, Brownsville, and Jackson/Humboldt. The image below was taken at 7:34am Saturday morning and clearly shows the delineation of very heavy rain over these areas. Many locations, including the WXLIVE! sensor in northern Bartlett recorded 8-10" of rain in a period of 3-5 hours, while areas south of I-40, including south Memphis, Germantown, Collierville, and DeSoto County got less than 1" of rain in the same period. On Saturday morning, the storms finally started pushing east as run-off filled ditches and culverts, then creeks and rivers, causing flood waters to continue to rise across the region. 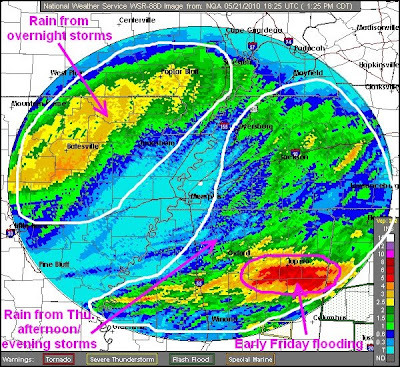 The heavy rain threat shifted south through the metro area, though a band of very heavy rain continued to affect areas near Highway 14 (Austin Peay Hwy) through mid-morning, exacerbating flooding conditions (see the link to pictures at the end of this post). Some storms became severe as they moved east through northern Mississippi, bringing hail and high wind. By Saturday evening, a surface low pressure and upper-level disturbance were moving from southwest AR to the northeast into southeastern MO, along the stalled front. High instability, abundant moisture, strong low and mid-level wind shear, and powerful dynamics came together to form supercell thunderstorms across the state of Arkansas during the evening hours. Evidence of the very favorable environment is depicted in the image below taken around 4:20pm, which shows storm chasers from across the nation setting up in Arkansas for the expected outbreak (each icon represents the position of a GPS-enabled chaser). Many of the storms during the evening received tornado warnings (as many as 6-8 at a time across the state of AR) as they moved towards the NWS-Memphis warning area. In all, ten tornado touchdowns were recorded across central portions of Arkansas. One of these storms, a strong supercell producing funnel clouds, large hail, and continuous lightning, moved up the Mississippi River around 10:30pm, prompting tornado warnings for Shelby County and a premature closing and evacuation of the Beale Street Music Festival. An EF-1 tornado that was on the ground for about 1/2 mile was confirmed by the NWS in the Millington area from this storm. Supercell storms continued moving across the region through the night (mainly east of the metro area), producing additional tornadoes, including an EF-2 near Humboldt, TN, a violent 27-mile, 1/2-mile-wide EF-3 that took three lives in Ashland, MS and Pocahontas, TN, and an additional EF-2 that took another life in Abbeville, MS (complete tornado survey recap linked below). Once again, persistent storms presented additional flash flooding concerns across northeastern MS and the TN River Valley. The stats are still being analyzed, but it appears that the areas north of Memphis that got 10"+ of rain experienced a 100-year flood, and the Nashville metro area was in the range of a 500-1000 year flood! River flooding was widespread and lasted throughout the weekend and into early this week in many cases. Unfortunately, flash flooding took the lives of at least three additional individuals in the immediate region, including one in Shelby County. Over two dozen died as a result of flooding in TN, MS, and KY combined. As for tornadic storms, there were 13 tornado touchdowns (as of this writing) in the NWS-Memphis County Warning Area (CWA) - defined as west TN, eastern AR, the MO Bootheel, and north MS. Four of these tornadoes were EF-2 or EF-3 and five deaths were attributed to tornadoes. We at MemphisWeather.net greatly appreciate all of the positive feedback received following our coverage of the severe weather the past two weekends. We consider the provision of hazardous weather information to the public part of our mission and are grateful that so many of you found it helpful. Our thoughts and prayers are extended to all of those whose lives were affected by the storms in one way or another and encourage all Mid-Southerners to find a way to help those in need, whether through the Red Cross or similar agency, or by just extending a hand to someone personally. The period of cold weather that persisted through winter and tapered off some in March swung the other way in April with a well-above-normal temperature average. At Memphis Int'l Airport, the average temperature for April was 66.0 degrees, which was 3.9 degrees above normal. The maximum temperature for the month was 86 degrees on the 14th and the lowest was 41 on the 9th. No temperature records were set in April. 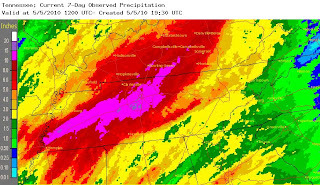 April was a wet month, though much of the precipitation fell on just a few days, evidenced by the fact that there were only 6 days during the month in which measurable precipitation fell, 4 of those with more than 0.50". The airport recorded 7.02" of precipitation, which was 1.23" above normal. The maximum precipitation in a 24 hour period was 3.35" on the 23rd-24th. The peak wind gust was 48 mph on the 24th. Click here for the NWS climate recap for April. The average temperature for April at the WXLIVE! station in north Bartlett was 65.5 degrees, about one-half degree cooler than the airport, with a maximum of 85.9 on the 13th and a minimum of 37.6 degrees on the 9th. April precipitation was very localized across the metro area. Though the airport got over 7", the automated WXLIVE! gauge recorded less than half of that at 3.29". A co-located manual gauge used for the CoCoRaHS program measured 3.82". There were 8 days with measurable precipitation, with a 24-hour maximum of 1.45" on the 24th. The peak wind gust was 40 mph on the 24th. Click here for a daily statistical recap on MemphisWeather.net. For the month of April, the average temperature error in all MWN temperature forecasts was 1.88 degrees, besting the compared computer models and the NWS by 0.12-0.48 degrees. Over 70% of the MWN temperature forecasts for the month were within 2 degrees of actual. For dewpoint accuracy, the MWN forecast was also the best of the data sources at 2.48 degrees average error. More detailed accuracy statistics can be found here. After an extraordinary weekend of severe weather, it's time to start looking forward a little bit. Typically in Memphis, we start seeing "summer-like" conditions during May. Well, May arrived and the first taste of summer may be early to arrive. Following the passage of an upper-level trough that brought the severe weather this weekend, an upper level ridge of high pressure will build in and dominate through much of the coming week. This will mean rising temperatures and mainly clear skies. A weak cold front will pass Monday night, bringing a few clouds, but after that it gets hot for mid-week. We could see our first 90 degree temperatures of 2010 by Wednesday or Thursday! In addition, with all of the evaporation from recent rains, humidity will be up a little during the day as well, meaning heat indices into the 90s will be possible. Fortunately, the heat will be fairly short-lived as yet another front moves in late in the week. Right now, it does not appear severe weather is a high possibility with this system, but scattered thunderstorms are possible Friday. Cooler high pressure builds in behind the front, bringing temps back into the 70s for next weekend. For complete details on the week's outlook, check out MWN's own 8-Day Forecast. 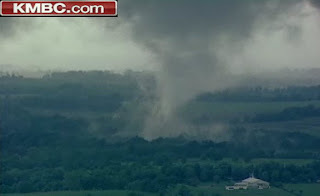 For damage pics from around the area, check out MemphisWeather.net on Facebook. BOOTHEEL LATE THIS AFTERNOON AND INTO THE NIGHTTIME HOURS.